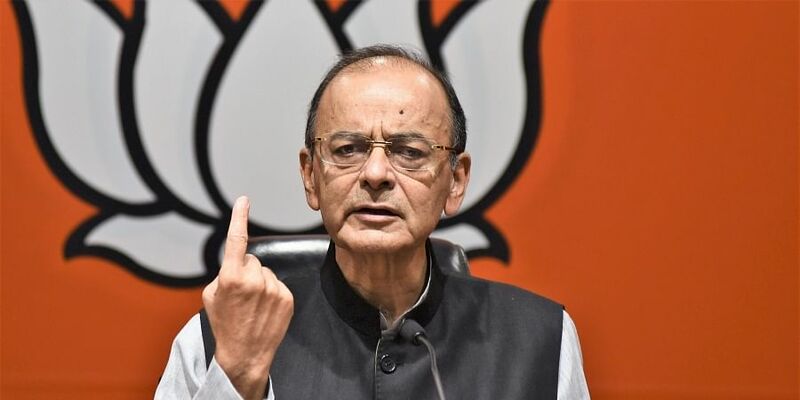 Calling the issue of terrorism in Jammu and Kashmir the biggest challenge before India, Finance Minister Arun Jaitley on Monday said it cannot be solved until the “failed obsolete thought” of Article 370 as a “loose constitutional connect” between the state and the rest of the country is rejected. He said the challenge needs a fresh approach and only a strong government and a leader with clarity alone was capable of resolving the Kashmir issue. Referring to the past Congress governments, he said the challenge cannot be resolved by those who created the problem and who believe that a “loose constitutional connect” will lead to integration.He added that it could only be done through a fresh approach “which is uncompromising on terror” and “committed to total integration” and through “reversal of the historical blunders”. Targeting the Congress, Jaitley said it was identified with the creation of the problem itself by “wishing the issue away” when Pakistan did not reconcile to Kashmir being a part of India.”Instead of working for total integration, the party wanted a loose and liberal constitutional connect between rest of the nation and the state under an erroneous impression that such an arrangement would further the cause of integration,” he said in a Facebook post. “Article 370 was disastrously thought out as a constitutional connect between rest of the country and the state. Article 35A was surreptitiously introduced in 1954. It catered to a separatist psyche and legitimised discrimination,” he added. Jaitley said terror supported from across the border “can’t be fought either with velvet gloves or a policy of appeasement”. “This challenge can obviously be resolved with a fresh approach which is uncompromising on terror, uncompromising in its determination to enforce the rule of law and committed to total integration. A strong government and a leader with clarity alone is capable of resolving the Kashmir issue,” he said. Targeting National Conference (NC) and the People’s Democratic Party (PDP), he said the two regional parties were, of late, more strident in advocating secession of the state if firm measures are taken. Development in the state has suffered due to terror and both democracy and secularism had been a casualty in the valley, he added. The BJP leader said the people of Jammu and Kashmir have to be at the centre point in India’s strategy and they should get opportunities, peace and security of life, and freedom from terror. Jaitley also attacked the opposition on the issue of Pulwama suicide bombing and Balakot terror strike saying whenever the two issues were raised, the opposition parties were on the back-foot and questioned why national security and terrorism were being made into subject matters of electoral debates. “India’s opposition argues that elections have to be fought on the ‘real issues’ and not on the issues of national security. It is my endeavour to argue that national security and terrorism are the most important issues which concern India in the long run. All other challenges are capable of early resolution,” he said. Jaitley said that poverty was declining at a fast pace, urbanisation was increasing, the size of middle class was growing and the economy was expanding, which would result in creation of jobs. “These are all challenges that India is capable of capturing and resolving over the next decade or two,” he said asking the question on where India stood on the issue of national security and terror. He said peace was established in Punjab, Northeast and in the South, and that the operation of Maoist terror was restricted and narrow. “As the economic profile of India move upwards, it will become extremely difficult for the Maoists to sustain their violent movement to overthrow democracy. The security ‘might’ of the State is far superior to handle this movement. The same, however, can’t be said of what is happening in the state of Jammu and Kashmir and terrorism emanating from region,” he added.